William Freeman Henshaw1,2 [William Franklin Henshaw7]. Born 17977,8 [about 18009], Connecticut7,8. The relationship between Nancy Lane and Rachel Lane is not known. William Henshaw, age 50, born in Connecticut; inn keeper. Rachel Henshaw, age 35, born in New York. Nancy Henshaw, age 22, born in New York. Roxie Henshaw, age 19, born in New York. Julie Henshaw, age 18, born in New York. 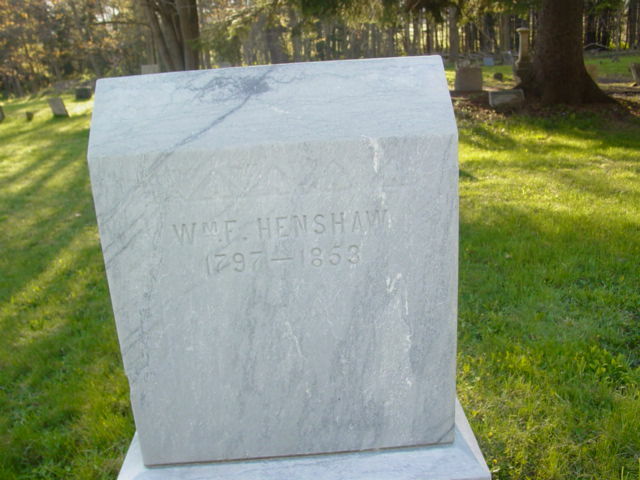 Henry Henshaw, age 8, born in Virginia. Fred S. Henshaw, age 1, born in Ohio. Also discovered among the names on the Fayette census was that of William F. HENSHAW, 50 years old, the father-in-law of Elias NIGH. Henshaw was the innkeeper and owner of the Harrison Hotel, one of Burlington's three hotels, "of which the town boasted". Elias NIGH was married to Henshaw's daughter Alice, who was 28 years old at the taking of the census. William Freeman Henshaw died Nov 13 18535,6,7,8 [Nov 12 185312], Cattaraugus County, New York5,6,7,8; buried Clear Creek Cemetery, Ellington, Chautauqua County, New York5,6,7,8. Died in Cattaraugus county, New York, on the 13th of November last, Col. Wm. F. Henshaw, formerly of Burlington, in this county, aged about 53. Contribution from Karen Whitmore () citing: family records. USGenWeb archives (http://www.usgenweb.org), Ohio, file bimpson.txt. 1850 census, Fayette Township, Lawrence County, Ohio; roll M432-701, page 438, line #36, dwelling #45, family #45. 1850 census, Fayette Township, Lawrence County, Ohio; roll M432-701, page 438B, line #38, dwelling #54, family #54.